Home > Deals, Music	> Twitter Deal Alert! Brave Original Soundtrack (Amazon MP3)! Twitter Deal Alert! Brave Original Soundtrack (Amazon MP3)! Oh, hey – cool Amazon MP3 Daily Deal offer! 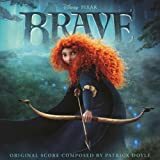 The original soundtrack by Patrick Doyle for Disney’s animated movie Brave is just $2.99 at the Amazon MP3 store (Daily Deal)!